Is it possible to be neutral being NATO´s pet? The Bellingcat team proves it is not when they exposed themselves as pro-Kiev infowarriors. In an age of neoliberalization of society according to its privatization dogmatism even the core business of the state, their monopoly to use violence, is being outsourced to private parties. Mercenaries from private corporations like Dyncorp or Academi enter the battle fields to provide their special ¨security solutions¨. Actually these are not the only military services privatized. Recent years show non-governmental organizations are encroaching the sphere of propaganda services in the political realm of warmaking, in the old days strictly top-down managed by state organizations. Though the organization of propaganda in the West always took a less centralist approach than for instance in the Soviet Union, these days one might experience an increased appearance of NGOs marketing the official state sanctioned points of view in direct relations with the media. One could say propaganda is being privatized too, outsourced to non-governmental ¨infowar mercenaries¨. Being neutral as a NATO pet? The character British ¨citizen research project¨ Bellingcat is playing in ¨the Infowar¨ between the West and Russia, is very disturbing for that matter. It is gladly welcomed by NATO commander general Breedlove, with an expression of hypocrisy as American as apple pie. In a tweet he praised Bellingcat and its founder Eliot Higgins for their ¨innovative way¨ in tracking invasive Russian actions in Ukraine. Some people may remember the ¨citizen inspections¨ at airforce base Volkel in the Netherlands, when activists tried to reveal the presence of US nuclear arms, held in secret by the Dutch and American governments. This had nothing to do with vigilant citizenship though, if we must draw conclusions from NATO spokes people. This was a terrorist operation, according to Breedlove´s predecessors. 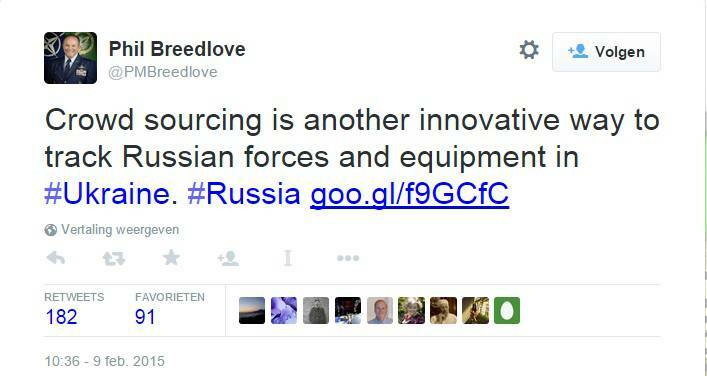 Probably Breedlove thinks too citizen involvement in military business should only be applied if it works for ¨us¨. “Crowd-sourcing” the way Bellingcat claims it is doing for the sake of a better world, sounds like a beautiful and meaningful method for bringing truth to the people. In fact in internet fora we are all doing the same thing, using the scope of the net to investigate or corroborate claims. But clearly Bellingcat isn´t neutral. Founder Eliot Higgins is a proud fellow of the Atlantic Council, a well endowed think-tank developping NATO policy and its intellectual basis. Bellingcat can´t be seen (any more?) like just another citizen research collective, but is in fact a well organized cover, maybe even an ¨astroturf organization¨, working for a particular geopolitical mission. At a level playing field perhaps this is not worrysome. But when it is becoming a force in wielding the powers of Empire, a fair degree of suspicion is suitable. For example a video of a rebel held BUK driving on his own to the launch site came up a few hours after the crash, posted on Youtube by an account which was only used once for this special purpose and then deleted. Fortunately Higgins could download it in that half an hour the vid was present and so at this moment he can be traced as the first known source ever posting the video (back) on the net. A couple of minutes later the website Torez.info, administrated by Vladimir Djukov alias @WowihaY, posted it too. Djukov was provider of more track trail evidence, for example an eyewitness account of the moving truck with BUK in Torez. Also he posted first on twitter the image made of an alleged trail the BUK left in the sky after being fired. This is the socalled ¨plume pic¨, also proof from which a whole array of doubts arise. Another example is the SBU Luhansk video of a fleeing Volvo truck carrying the alleged murderous BUK installation missing one missile, which Bellingcat gives credibility by ignoring all problems with the authenticity of the footage . All this evidence ends up uncontested in the Bellingcat reports, which begs the questions if in this MH17 case the role Bellingcat has assigned to itself is giving trustworthyness to stuff coming from dubious if not very non-impartial sources (in fact: from a suspect in this case, elements within the Ukrainian state). 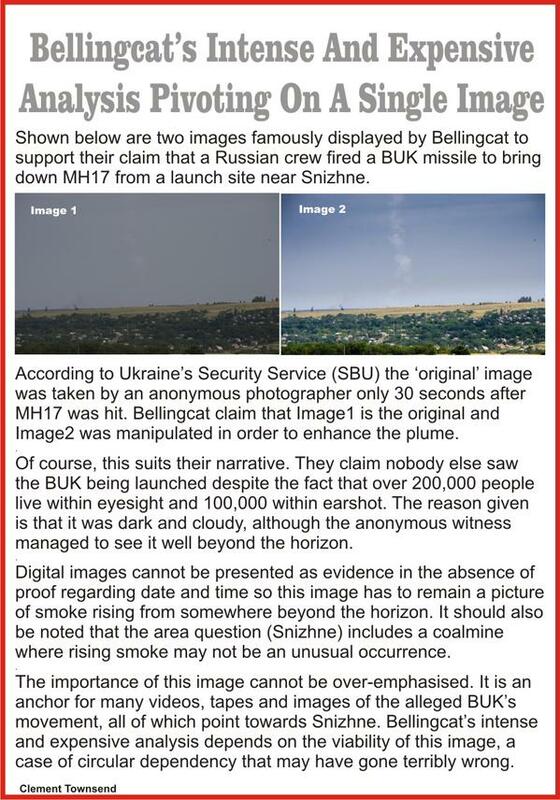 Recently this ¨whitewashing¨ of earlier by the SBU conveyed evidence seemed to reoccur when Bellingcat issued two reports attacking the authenticity of the satellite images the Russians issued at their pressconference four days after the MH17 disaster, implicating the Ukrainians. These reports from 31 May and 12 June were manifestations of the last important move so far in the full blown blame game that broke out within a few hours after the crash. This Infowar started with the infamous manipulation of a posting on Russian social media, attributed to rebel commander Strelkov, followed up by a (fake) SBU video with alleged ¨confessions¨ made by the perpetrators. When Ukrainian official Gerashchenko in a facebook message lit the fire ranting ¨Putin! You and your companions can´t escape an international tribunal!¨, the blame game took its murky course. Probably the Russians felt they had to do something to strike back to set the scores. At a press conference on 21 July they issued, next to radar images allegedly displaying SU-25 jetfighters in the vicinity of MH17, some 6 satellite images . At these SATs two Ukrainian BUK complexes could be seen at a site a few miles south of Zaroschenskoye village, a site within firing range of the plane. These BUKs might have arrived, as the Russians suggested with other SATs, from army bases A-0194 (6 km northwest from Luhansk) and A-1428 (5 km north from Donetsk). On 31 July a counter attack was launched by the SBU, aimed at these satellite images. They boldly claimed the images were forgeries. Reference analysis – comparing the Russian SATs with SAT images from other dates – allegedly showed the Russians in fact had used wrong SATs from wrong dates. The SBU evidence was based on evaluation of vegetation patterns (some Russian SATs missed a strip of uprooted plantations) and patterns of human interference (i.e. tractor trails, trails of BUK presence). 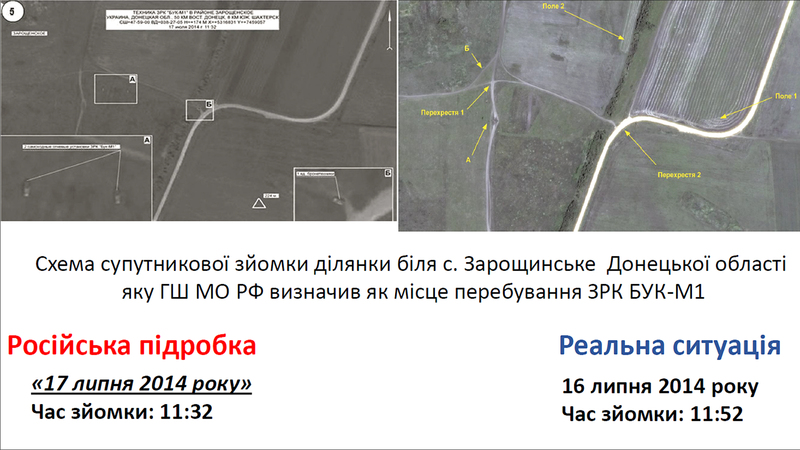 The SAT image displaying the Zaroschenskoye site at the day of the crash had been retouched as well, planting BUKs at the site near the village that, according to the SBU, never were there. Russian response was imminent. On 1 August they disputed the argumentation put forward by the Ukrainians. The SBU SAT of the Donetsk army base would allegedly show the wrong weather (i.e. no clouds on a very cloudy day), and the strip of uprooted plantations was put in by ¨distorting¨ the original image. So the SBU SATs were dateforgeries and fakes themselves, the Russians claimed. So both parties accused each other of messing with dates and creating fakes based on clouds and vegetation, boosting a level of political tension which could eventually even lead to a world war. Then suddenly the SAT issue stopped – until it popped up again in the Bellingcat May/June reports. Call in the third party experts! So for taking back the initiative in the infowar again and getting back at the Russians, there had to be cast doubts about the Zaroschenskoye launch site the Russians had appointed with their SATs and now corroborated with the calculations of the secret report. Of course it wouldn´t have the same effect if the SBU issued the same evidence as they already had done back in July. Obviously the way to proceed was to propel the arguments by a well known PR technique: disseminate your point of view by a socalled ¨objective third party expert¨. If information would be coming from a reliable source, like a highly praised British citizen research project, and not from a very crafty secret service known in general for their lying and manipulations, the old evidence could be branded as totally new and impartial as well. Besides, the western media had already made clear they liked the image of a new innovative internet based research technology and in most cases they could rely on their well educated ideological attachment to the official pro-NATO propaganda as it is. Therefor Bellingcat could veil itself convincingly with the cloak of a ¨third party expert¨. So when in the days following publication of the Novaya Gazeta article the Ukrainian media explained the official position of the ruling party to the ¨home market¨(layed down by the SBU back in July), Bellingcat served the western and pro-NATO audiences with its 5/31 report. In fact this report recycled in full the SBU report from 7/31, but added to it more techniques for analyzing. It also used a bit more reference material, images assembled by the open source SATs of Google Earth. A new technique applied was metadata analysis of images the Russians issued during their 7/21 pressconference, aimed to get evidence they were digitally modified by Photoshop. Error Level Analysis (ELA, with the internet available tool Photoforensics) was used to prove at what spots exactly the images had been altered. Remarkably enough further inspection of the Russian SAT showing the BUKs at the Luhansk base A-0194 was set aside. Nevertheless the counter argument the SBU had given about that particular base layed the same groundwork as used for falsifying Russian SAT images of Donetsk army base A-1428. After the base had been attacked by rebels with artillery fire, only broken vehicles were still present to be spotted. Hence they couldn´t have been moved to a launch site. Apparently the story to be proven was the Russians in fact had shown not only one but two airforce bases with BUK complexes run over by their own rebel companions well before the 17th of July. A timeline was constructed from a broken truck leaking oil, creating a pool of spilled oil growing in time. Another timeline was based on changes in vegetation patterns over time, showed at a couple of Google Earth images. The same strip of land with the uprooted plantations the SBU had appointed, returned polished and brandnew. With this reference analysis Bellingcat allegedly proved, as the SBU had tried before on 31 July, the Russian SAT originated from a date before 17 July. Now metadata and ELA analysis proved the SATs of airbase A-1428 were digitally altered too. With respect to the 7/17 Zaroschenskoye SAT (with BUKs visible at an alleged launch site) reference analysis was done by comparing it with the Russians own 7/18 SAT of the same site (the one without the BUKs). The yellow arrows the SBU had used pointing to missing trails and other ¨terrain inconsistencies¨ returned almost unchanged in the Bellingcat report. These SATs couldn´t be taken one day after the other, according to both SBU and the impartial British investigators. That is to say, when one could see and believe what was claimed. So Bellingcat ¨detected¨ the distinct changes in soil structures after the SBU had done the same back in 2014. In fact most, if not all, of these changes could, as the Russians themselves claimed, be attributed to the specific characteristics of the Russian SAT image with its low level of brightness, lack of contrast and a much lower resolution. But with metadata analysis use of Photoshop was proven and with ELA was made clear the 7/17 BUKs were digital alterations. Referencing these Russian SATs with two other SATs, dated at 7/16 (again: used by the SBU earlier on) and 9/13 (Google Earth) put, according to Bellingcat, the Russian SATs well before 17 and 18 July. So the BUKs had been put in with Photoshop and the Russians had done this to an SAT image of the wrong date. Though the case was in fact almost identical to the case made by the SBU in their report on 31 July, detection of Photoshop use wrapped it all up. Not only the dates were forged, but also the images themselves. The observation it was quite puzzling why the Russians hadn´t used SATs of the right date to make fakes, didn´t matter now a double layer of fraud could be established. The Russians weren´t just liers, they were inclined to lie in every aspect of their information. That was all Higgins wanted the world to know. In reality the 5/31 report met very strong criticism, in fact leading to debunking of the entire methodology – the complete set of analyzing techniques Bellingcat had lined up against the Russians. Obviously this criticism didn´t enter the newspaper columns or news items on TV, except for one important and surprising exception. German magazine Der Spiegel had an interview with German forensic analyst Jens Kriese who tore the Bellingcat investigation to pieces. Another forensic analyst, Charles Wood, listed quite a few methodological problems too. Bellingcat replied by smearing Wood. One of the problems with the Bellingcat methodology appeared to be its use of Google Earth images for reference analysis. Google Earth assembles their presentations with SATs from very different days, sometimes months apart from eachother. So the images will be unfit for use in forensic research and date based reference analysis. Google Earth itself explains this too. With metadata analysis use of Photoshop was proven, according to Bellingcat. But in fact this wasn´t a very strong case. Photoshop could have been very usefull for the Russians making SAT imagery ready for presentation, for example by downscaling their images to get a manageable format. But the answer Bcat gave to this criticism could be written large: Why didn´t the evil Russians use a far more simple tool for that?! Also ELA, the technique used for analyzing digital alterations, had been used all wrong. Especially if applied to satellite images, as a Russian scientist made clear here and here. Best debunking came from a famous Russian blogger, who proved very lucidly the way ELA analysis had been used to establish digitally modifications was worthless. https://ntv.livejournal.com/398128.html When dr. Neal Krawetz, developper of the tool Photoforensics, distanced himself firmly from the investigation and even said ¨This is a clear example of how NOT to do ELA¨, the case was settled. Outside the media that was. @Malinka1102 "distances itself"? Understatement. I had nothing to do with their faulty analysis. Still the SBU must have experienced some relief. The headlines were there. And deploying infowar mercenaries as third party experts appeared to be a very smart thing to do, certainly if they could take all the fall-out when things went wrong. Now metadata and ELA analysis had been debunked, all that remained was the old SBU story, and this hadn´t proved convincingly the Russian SATs were frauds. But Bellingcat was eager to fight back and win this SAT war one way or another. Best chance of success was hidden in the 7/17 Russian SAT of Donetsk army base A-1428. The Russians had claimed a BUK was missing there because it was on its way to the launch site south of Zaroschenskoye. Higgin´s ambitions appeared to be very incited when he said to me in a short twitter interview he would buy 1000$ per 25 square kilometers high-resolution SAT imagery from commercial provider Digital Globe ¨to put a final nail in this particular coffin¨. Bellingcat built up its Grand Finale starting a crowdfunding mission. This way they were involving the people in a battle of good against evil and holy truth against lies, creating more bonding with the pro-Ukrainian pro-NATO cause they were peddling. 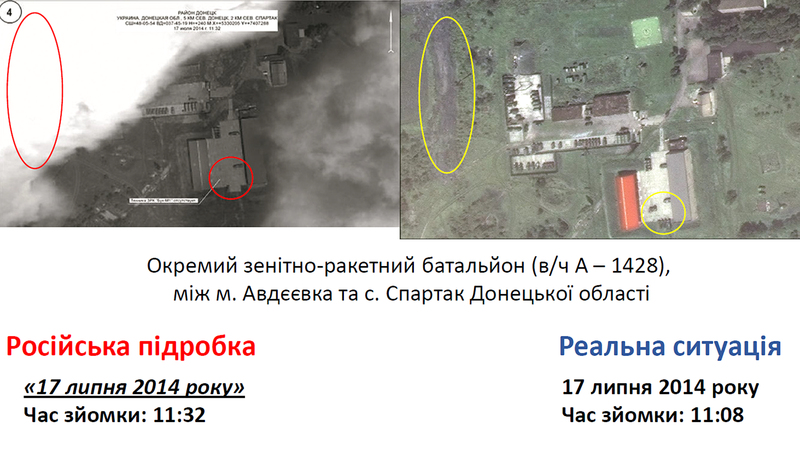 So at june the 12th Bellingcat issued a new report including their freshly purchased Digital Globe SAT image, which would prove the BUK launcher never departed from the truck yard of Ukrainian army base A-1428, as the Russians had claimed it did. And so it happened. The BUK stood at his own spot in the truck yard and again with the help of Google Earth SATs was proven the Russian image originated from a date well before 7/17. There were some minor problems though. First, the old vegetation based timeline and uprooted plantations appeared again, but also in this case the reference analysis leaned on possibly not very reliable Google Earth imagery. Second, the Russians had claimed ¨the area had 70 to 80% cloud coverage and cloud base height of 2,500m¨, which was right according to the weatherforecasts for that area at that time. However, the image Bellingcat provided showed a clear sky and sunny weather. Hence it was imperative the source of the SAT image was infallible regarding date and time. But Bellingcat didn´t provide a certification of authenticity with an exact and unambiguous date handed out by Digital Globe, something forensic analyst Charles Wood had strongly advised them to do. After all also an image from Digital Globe could be assembled by taking parts from images of different days and even of different providers . Things got worse when I found out the Grand Finale, the SAT allegedly freshly bought with community funds which would put a final nail in the Russian coffin, in fact had already been used by the SBU in their 7/31 report. Overlay of the 7/17 freshly bought Bellingcat SAT and the 7/17 SAT the SBU used in their 7/31 report. Source Analysis: Are they lying? ¨In connection to this, we can state that according to the Russian space surveillance system, Ukrainian satellites Sich-1 and Sich-2 were not flying over this territory from 10am to 1pm Moscow time (GMT+4; 9am-12pm GMT+3) on July 12, 16, 17 and 18, 2014¨. Meant by this Keyhole series is the Digital Globe satellite . That would make sense too, because both images – the one Bellingcat issued and the SAT the SBU used – have both been taken at exactly the same time on the same date (2014/07/17 at 11:08 EEST). Moreover, they show exactly the same shadow angles, the same sunny weather, the same absence of clouds. There was only one remarkable difference though: the blue roof in the Bellingcat SAT (which was the right colour) can be seen as an orange roof in the SBU image. The SBU countered the accusations by stating they bought the imagery from commercial partners. In a press conference broadcasted by the infamous Ukrainian Crisis Media Center (8 August 2014) Viktor Yahun, Deputy Head of the Security Service of Ukraine, cleared the air (watch from 10:53). 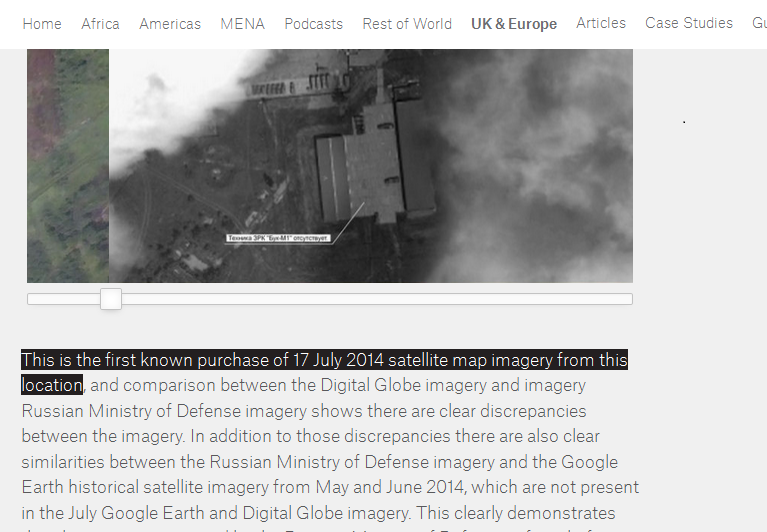 Strangely enough Bellingcat explicitly mentioned in its 12 June report they were the first to purchase this imagery. Why did they do that? Did the SBU get it for free from that commercial party then, since they had been the first receivers of the same image? Or is somebody lying? Did the Ukrainians lie and did they actually get it from the US? Did they both lie? Because eventually Bellingcat might have received this ¨final nail in Russia´s coffin¨ from either the US or the SBU. It´s easy to imagine these interconnected brothers in arms coordinated their actions at some level. Without any clarifications and authentications (or a lot of money to buy the SAT) no one really knows. Only in 2016 Bellingcat’s Eliot Higgins sent out a tweet in which he confirmed the SBU had indeed used the same Digital Globe imagery. Again it appeared to be the case Bellingcat had done nothing more than polishing up old SBU stuff. Obviously they wanted to sell their 12 june report as new and impartial evidence which would take us to a final climax revealing the forgeries made by the Russians. This can be seen as misleading the crowds they got their money from as it is. But if they got the Digital Globe SAT from the SBU or the US they could even have committed an act of fraud. In each case they should have taken the advice any forensic analyst could give them: take care of your own sourcing when investigating the sources of other parties. Their one-sidedness, their non-scientific approach and lack of doubt, their dogmatic thinking, and their deeply ideologically motivated attitude is almost becoming a kind of religious fanatism in which they implicitly think of themselves as crusaders of truth. It´s a narcisist self image we know so well from the inclinations of the lords of the anglosaxon dominated world orders. Moreover, this all raises questions about their methods too (for example: their investigations always smell from confirmation bias). From that on it should be clear Bellingcat operates like a team of infowar mercenaries, recycling and reinforcing alleged evidence originating from dubious parties. In that way they are whitewashing the Ukrainian secret service by playing the role of an objective third party expert to gain trust at (pro)western news markets. Their pursued line of propaganda is obvious as well. The assigned task is to discredit all information coming from critical and Russian sources and replace it with information that suits the agenda of Empire. Specifically they put a lot of effort portraying the Russians as perpetrators of the attack at MH17 based on a lot of wishful thinking and suggestion but factually absent evidence. For that reason their credibility will be boosted by pro western and pro NATO sources. The stronger their glorification the more impact their message. We should all be aware of that when the next Grand Finale will arrive. Some things in the satellite war have become much clearer since I wrote this piece. Though Google Earth is not that sound for doing reference analysis (see image and explanation below), in this case Bellingcat and the SBU could be right about the missing Buk from airforce base A-1428 as allegedly detected by the Russian satellite. (False) conclusions reach us really swiftly. As can be seen, the sparsely vegetated area in april saw a very sudden and full boom in green growth in only three weeks. Second, 2012 must be a very rainy year compared to 2014, because the plantations still are full grown whereas in 2014 drought has fallen in much earlier. Third, the plantations from 7 May 2012 and 14 August 2012, three months apart, both show full vegetation patterns, so 2012 must be a very moist and fruitful year compared to the dried up July fields of the 2014 Bellingcat study. Hopefully the reader gets the drift (i.e. the plantation part of the GE image dated at 14.8.12 image is exactly the same as the one dated three months earlier). If one would perform some reference analysis during all these months in 2012 or wishes to establish the vegetational constitution in August by looking at 2012 and 2014, one would be puzzled by the magic rise, existence and fall of these rare plantations. In fact it is shown no reliable timeline can be established by using Google Earth imagery at face value. Best proof consisted of pictures that were dug up from social media, showing damaged ATO Buk 132 standing at the contested position. (See Bellingcat 12 June 2015 report, p.11). Damaged ATO Buk 132 at airforce base A-1428 Spartak/Avdeevka, left behind by the Ukrainian army in March 2014. Blue roof as seen on satellite imagery is visible too. Photo is posted on August 8th, 2014. This says the Russian 17.7 satellite image from airforce base A-1428, not showing this Buk, might have been forged as it does not seem likely this broken Buk with rusted caterpillar belt was moved away from base on and around this day. On the other hand, an American engineer, who wrote an extensive study of the military positions in the Zaroshchenskoye pocket and whereabouts of Ukrainian Buks, claims something else. Founded on satellite imagery he concluded Airforce base A-1428 was shelled in late summer 2014 or there after, leaving vehicles on the base crippled only then (see p. 23 and note 38). Supporting his position was that this Buk seemed operative on satellite images before the summer, as its launch shoe appeared to have been turned regularly. Furthermore, though the radar facility of the base was destroyed by fire at 21 June, Buk 132 seems to have been demolished by human hand and not by shelling, as Bellingcat had assumed. Footage of these vehicles destroyed by shelling and fire (TELAR 132 and reloaders TEL 113 and 133) appeared only in March 2015. Summarizing, the Buk was at least operative until June – with its seemingly rusted caterpillar belt – and was damaged partly some time before August the 8th. From this it cannot be concluded 100% certain it was not moved. So we have to rely fully on un-authenticated US imagery, the one bought by Bellingcat. This image cleary shows the Buk was at his place on 17 July, 11:08 local time, instead of sent to a launch position somewhere near Zaroshchenskoye. The situation regarding the two Buks south from Zaroshchenskoye – also shown on 17.7 Russian satellite imagery – is even a bit more complicated to assess for non-experts. The first attempt Bellingcat launched to attack these images failed enormously, as mentioned in the above article. They also launched a second attack, or to be more precise, people from @Armscontrolwonk (Jeffrey Lewis) in the same anti-Russian “citizen” network tried, summer 2016. With another tool, Tungsten, they allegedly showed a lot of inconsistencies, that is, digital alterations that showed the imagery was forged. Also this attempt failed, as – again – results from analysis were misinterpreted and showed a lot of bias. And again, Photoforensic expert dr. Neal Krawetz wrote a devastating blog about it. Another attempt was made by dr. Marco Langbroek, expert in satellite technology and tracking. Langbroek claimed that, though he was not an intelligence expert in assessing satellite imagery, the angle at which the Zaroschenskoye Buks were shown on the imagery, did not match the angle the satellite was positioned towards the perpendicular axis on this spot on earth (the so-called “off-nadir” angle). A social media poster Masami Kuramoto, also known for his knowledge of satellite technology, contested. He wrote a few blogposts in which he stated Langbroek had misinterpreted the imagery. In fact, a model of the Buk would fit nicely on top of the Buks on the 17.7 Russian Zaroshchenskoye satellite image (see below). People should study for themselves, but in these cases its not that simple to come up with a clear answer. Of course in the end – though also some very politically biased astroturfers claiming to be impartial might also struck the truth sometimes – the criticism I wrote down in the above article remains valid. Bellingcat is not just a citizen initiative. Bellingcat is not unbiased nor impartial. Bellingcat conducts investigation that is rigged by a strong inclination to come up with preconceived results. Its imperative also journalists and documentary makers longing for hypes in the realm of investigative journalism by non-experts are aware they have to make a distinction between grassroots and astroturf organizing. Regarding reliability of Digital Globe dating, see location (base A-1428) on Terraserver, and toggle through the dates September 3, September 13 and October 6, 2014. Notice what happens to the blue roofed building! Obviously the uprooting of the plantations could also be explained this way. ← Did the Ukrainians shoot down flight MH17? Where can we find the evidence that the Paris match photo is not taken on the morning of July 17? You have to deduct that from the timeline. The full SAT image has been taken at 11:08 EEST. Bcat owns two slivers, from Donetsk to just crossing Makiivka 12 kilometers away. When the truck left the site right after the freelance photographer of Paris Match spotted it at 11:00 EEST according to shadowcasting calculations, it had only 8 minutes to drive of the SAT range depicting a third of the road to Zuhres (=12 kilometers). Maybe the Truck departed earlier, but Bcat hasn´t responded to my question with which earliest time of departure they have calculated their assertion. This means the truck would have to drive at least at 90 km/h. That seems a little too fast for such a heavy transport vehicle. When calculated from the Zuhres video, it drove only at about 30 km/h. So they have two SAT slivers from 7/17, displaying Donetsk and a third of the road to Zuhres. They can´t see the truck anywhere. So the PM pic doesn´t exist within the timeframe – unless they miraciously could time the pic much earlier. Let’s not overlook the sheer embarrassing idiocy of “Bellingcat” (which is basically Eliot Higgins, his laptop and his couch). However much he is talked up by the media, he is in reality an untrained amateur, and his “analysis” of the RU satellite images consisted of uploading them to FotoForensics and misreading the results. FF is not a specialist outfit, it’s a popular resource for ordinary people to do basic ‘photo analysis.’ Anyone with a computer could do what Eliot Higgins did, only probably better. If this idiot-buffoon is really a member of the Atlantic Council then it’s salutary warming to us not to over-estimate the competence and intelligence of these guys and their willing tools. Pingback: En de regering blijft doen waar ze goed in is: LIEGEN | Silvia's Boinnk!! !